After making a few ‘Metainsects‘, I started to think about what kind of predator would adapt or evolve to feed on such ornery little beasties. What would they look like? With an anatomy-themed exhibition coming up, I started to carve a bird’s skull, but one that would eat tough, large and potentially dangerous insects. The skull is quite chunky and crested, so the bird would almost certainly be flightless but probably a good runner. It has a large braincase, so would be smart. The whole skull is about 25 centimetres (approx. 10 inches) long. The nozzle on the beak would fire a sticky mucus that would disable the defences of the prey. This is adapted from a similar system used by a seabird called a fulmar, which shoots foul-smelling secretions at potential attackers from a similar nozzle over it’s beak. 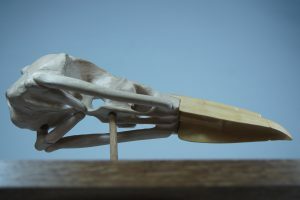 The large beak would then be able to pick apart the prey. 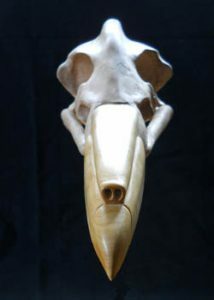 The skull part was carved from a single block of sycamore. 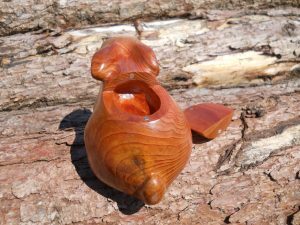 The beak and nozzle are carved from a piece of English boxwood. The stand is stained oak and bamboo. 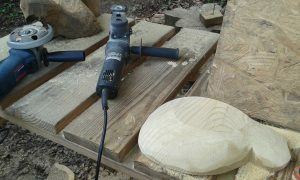 I really enjoyed carving the ‘Predator bird’s skull’. It gave a chance to revisit my studies in Zoology and the anatomy of this skull is based on those of real birds. The different bones shown ‘fused’ to form it match those in nature, albeit with some features (like the crest of bone) added or changed. 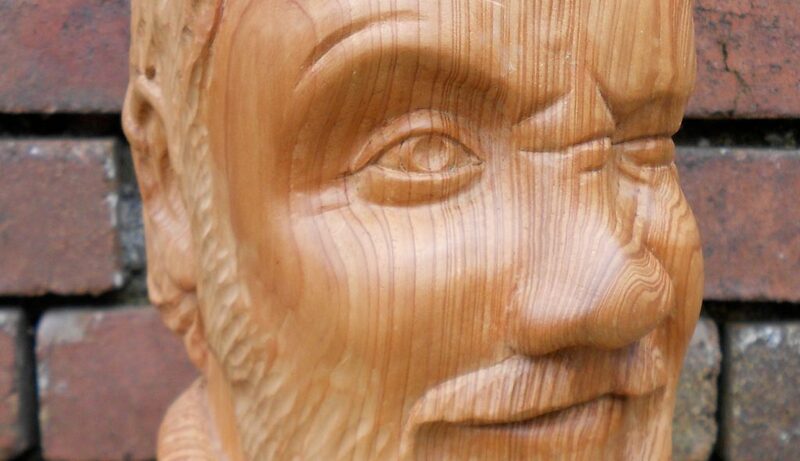 This was carved from a piece of a big Lawson Cypress tree that was cut down next to Ashton Court mansion in Bristol. The work was part of a landscaping scheme, but was very controversial at the time. 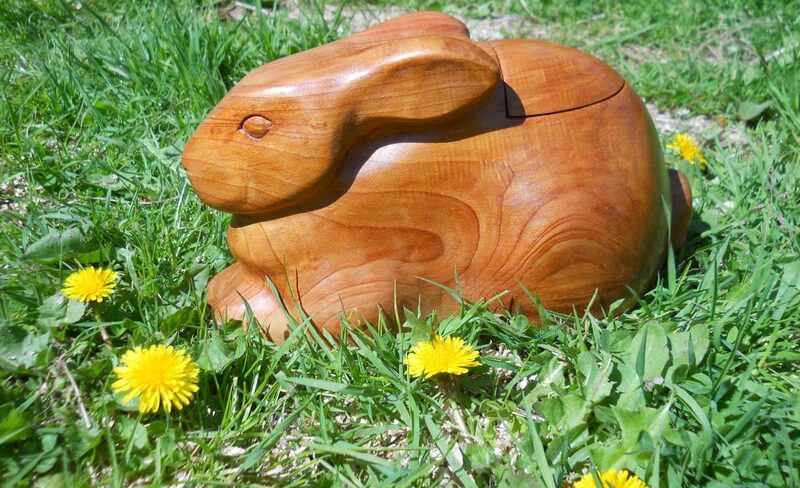 It’s nice to think that some of the timber has gone to a creative use instead of rotting away. 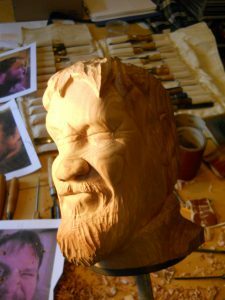 I’d wanted to try carving a self portrait for a while, as it’s a real challenge for a carver to get right. 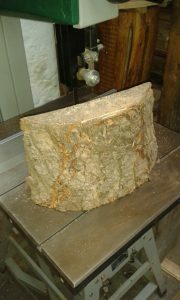 Using a piece of such an iconic Bristolian tree also reflects my affection for my adopted home town. 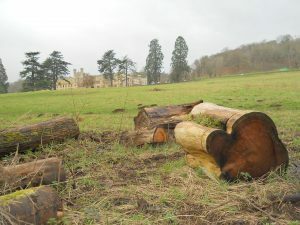 After milling it into usable pieces on site (with permission), the timber was also being used in many projects that I was working on at the time. I got the chance to make a self portrait with an exhibition called ‘Cornucopia’ at the Grant Bradley Gallery in Bristol, UK in 2013. Portraits are pretty tricky things at the best of times, but self portraits show a bit more of your ‘soul’. I suppose that’s why so many artists have had a go at them: it’s a real test of skill and technique. However, on the plus side, the model is always there and works for free! Many people just show a face-forward, neutral expression when attempting this kind of thing but that seemed a bit easy to me, so I decided to wink instead. Or perhaps it’s a grimace? I’ve always been very impressed by the character heads made by Frans Xaver Messerschmidt and carving an expression seemed a natural thing to do. The sculpture is about 24 cm (9 1/2 inches) high and took a little over 42 hours to make. 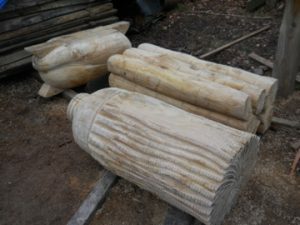 The soft timber wasn’t easy to work with and sometimes powered abrasive tools (like a Dremel multitool) gave better results than chisels and gouges. no matter how sharp the latter were kept. 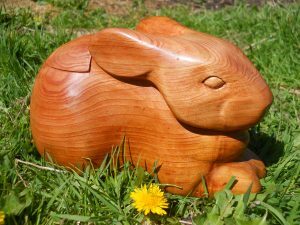 I’m particularly happy with the way that the expression turned out, which the grain of the timber helps a lot. The sculpture also captured the perspective distortion from the reference photos – the face (which was closer to the camera lens) is exaggerated while the ears are reduced to almost disappear behind it. I like the effect- it’s a caricature and it reminds me of some portraits by the artist Chuck Close that I’m fond of as well. 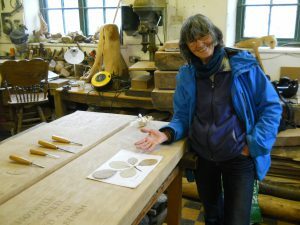 This portrait of the well-respected poet and botanist Libby Houston was carved into a large oak bench that I designed and made. which is now sited on the Clifton Downs in Bristol. 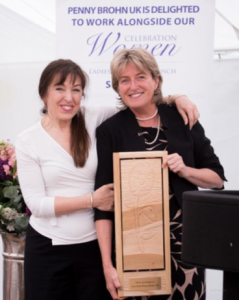 The leaves that she is holding are from a Houston’s Whitebeam, a sub-species of Whitebeam tree (Sorbus spp.) which is only known from a single specimen growing in the Avon Gorge near Bristol. Libby discovered the tree and it has been named after her. 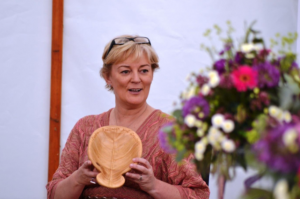 When Libby visited, she brought the leaves with her for me to copy in carvings on the bench and also very kindly explained what made them distinct from similar trees. Whitebeams are deciduous, meaning that the leaves are shed by the tree every autumn (fall). 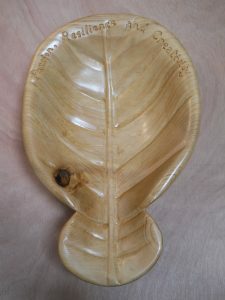 Therefore obtaining these leaves hadn’t damaged the tree at all. After she had left I realised that, since there is only one specimen of this tree known to exist, they must be leaves from the world’s rarest tree. 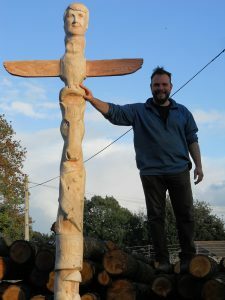 This totem pole shows things that are important to the person who received it – a collection of personal totems including an owl, a horse and a trout. 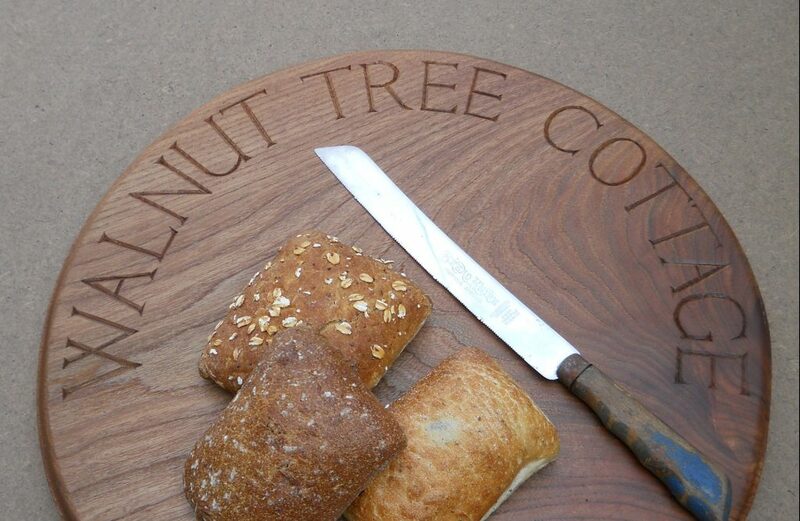 The piece was carved for a commission in 2012 and is now installed in the New Forest, Hampshire. 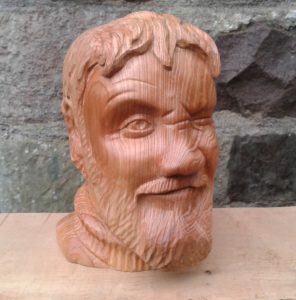 It was a lot of fun to carve but also quite a challenge, as it includes a portrait of the person that it was a present for. 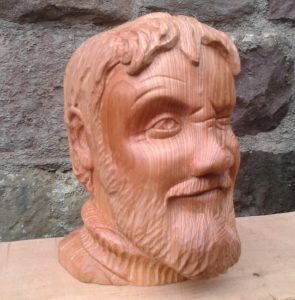 This was the first portrait that I had been commissioned to carve. 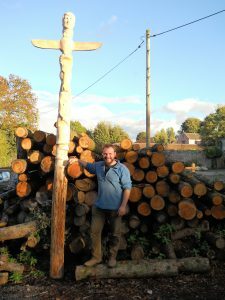 The pole is carved from durable European Larch, grown in the local area to my workshop. It is 14 feet (4 m 20 cm) tall in total, with 4 feet (1m 20cm) going underground when installed. I couldn’t meet him in person to take measurements and so the portrait had to be done solely from photos, which were all taken at different times in his life. 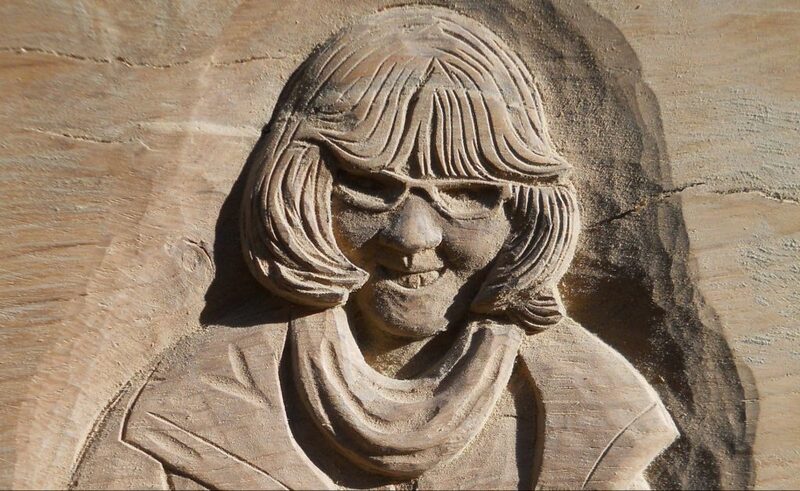 I never got to meet either the person who commissioned it or the subject of the portrait carving, so have no idea how close the likeness is! Apparently he likes the carving though, which is what everyone wanted. 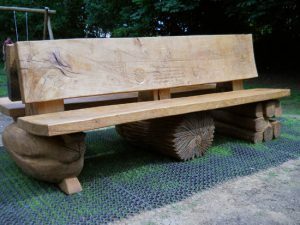 This bench is the largest single project that I have taken on to date, being 2.5 metres (8 feet) long and weighing well over half a ton. It was commissioned by the Clifton and Hotwells Improvement Society in Bristol and was installed in June 2015. 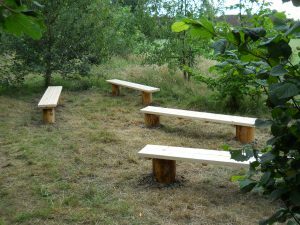 The wood is oak that originally grew on a farm outside the village of Backwell, about seven miles from where the playground where the bench has been situated. 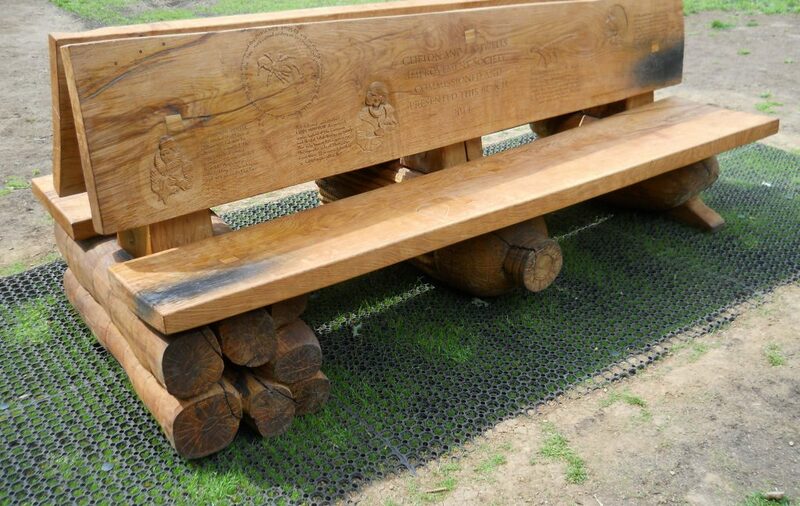 The bench is quite unusual, as the site that it has been placed on is part of Clifton Down in Bristol. The Downs Committee, who oversee the running of the area, hardly ever give permission for permanent works of art to be installed there and I feel very privileged to have been given this opportunity. 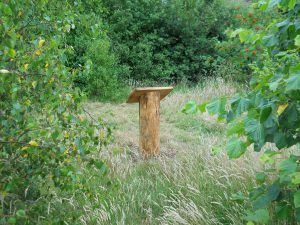 The bench was almost two years in the making and shows notable people, creatures and structures to do with the area. Researching it myself was fascinating. 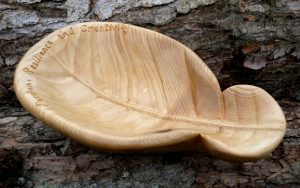 One carving is a portrait of renowned poet and botanist Libby Houston, who visited my studio a couple of times. Showing her the portrait for the first time was a little nervewracking! Fortunately, she liked it. Amongst many other subjects, the bench also shows Thecodontosaurus, the ‘Bristol Dinosaur’, which was discovered not far from the playground. 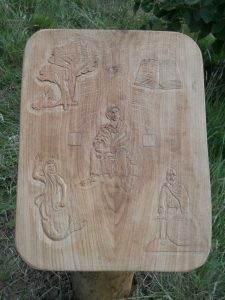 The bench rests on three large oak carvings showing creatures that lived in the seas that covered the area millions of years ago; a crinoid, a coral colony and a brachiopod (a shellfish a bit like a modern clam). 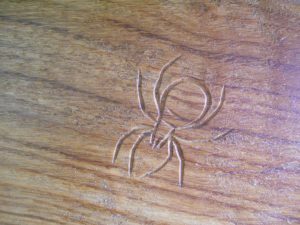 There is also a ‘treasure trail’ of ten spider carvings hidden all over the bench for visitors to try and find if they can! 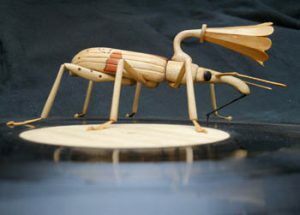 ‘Gramophone Weevil’ imagines a future world where modified insects, produced for a particular short-lived role, are easier to come by than scarce vinyl records. 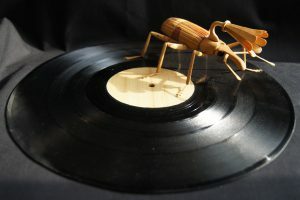 This creature has been engineered and produced to play records until it needs to be replaced. 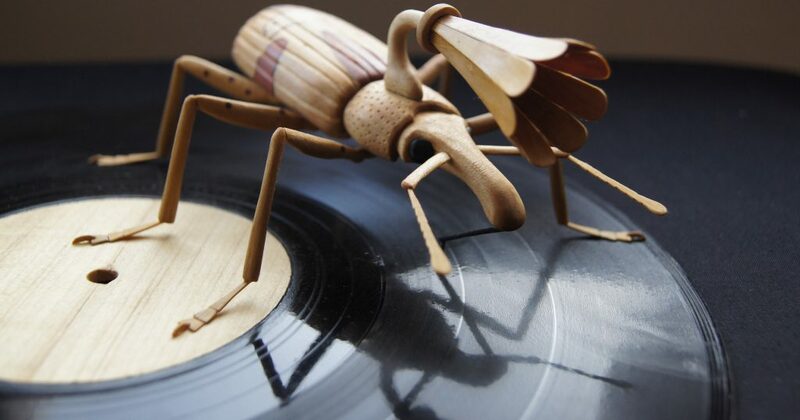 The mouthparts are purely adapted to hold the needle that plays the vinyl, as it doesn’t have to feed to perform its function. 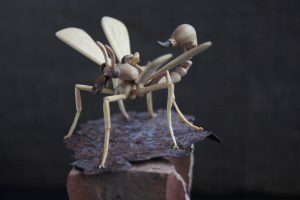 The sculpture reflects my concerns about some current research projects (specifically the US Defence Department’s HI-MEMS project), which look to engineer insects into tools for human use. Considering how much longer insects have been around on this planet, I can’t see success in such endeavours ultimately ending well for humans in general. This particular piece was also partly inspired by the amazing VW camper record player in Money Mark’s ‘Hand in your Head’ video. 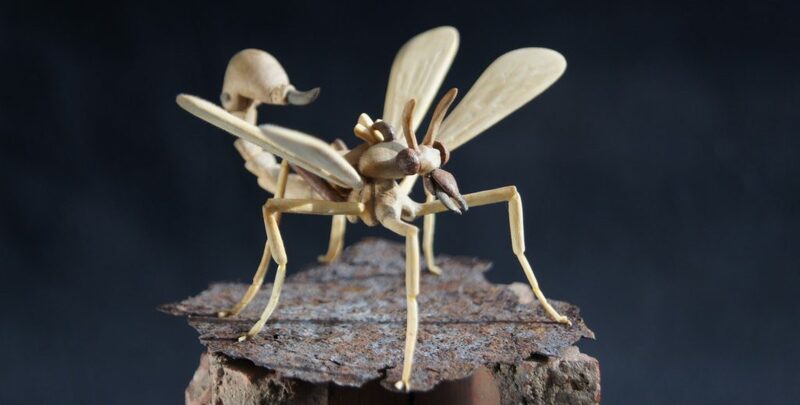 ‘Scorpion fly’ is one of a series imagining the potential results of the ‘HI-MEMS’ project, currently being undertaken by the US Defence Department. This project is trying to find a way to implant controlling and offensive technologies into insects. Although most entomologists are sceptical about the chances of success, billions of dollars have been poured into this project. Given the huge numbers of offspring that each insect could potentially produce, I reasoned that the ultimate goal would have to be to implant nanofactories, rather than individual nanodevices to perform whatever job is required of the insect. 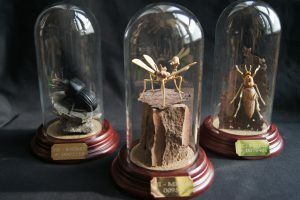 These tiny factories could then make reproductions of themselves as well as whatever device they were designed to make, with the new factories becoming implanted into the insect’s offspring and so continuing the process. Of course, with both insects and technology reproducing the potential for mutation and rapid evolution also increases, as well as the chances of technologies crossing between species. It would be very hard to keep control of such a process and humans don’t have a great record of keeping control of interventions in the natural order: cane toads in Australia being an obvious example. If such creatures could breed and evolve, what would they become? I’ve made a few breadboards using the beautiful wood from English elm trees. 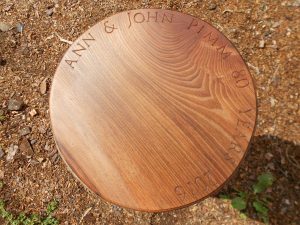 Unlike oak, the timber is quite resistant to splitting and doesn’t contain a lot of harsh tannins, so it seemed a good choice from which to make and carve this breadboard. 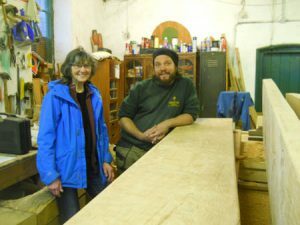 There are only two difficulties: elm is a bit trickier to carve than many other timbers and, since the ravages of Dutch elm disease, it is much harder to find pieces that are large enough to make a board from. 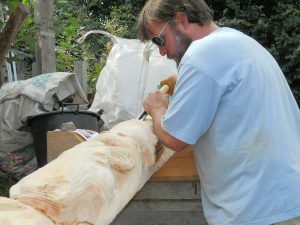 Of course, I’d be happy to make carved boards using other appropriate timbers! 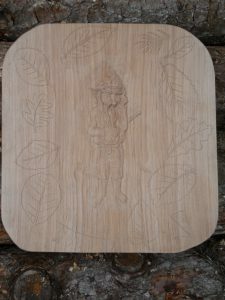 If you’d like advice on this or if you’d like me to make and carve a breadboard for you, please feel free to get in touch. 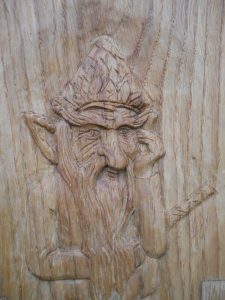 This character was carved as part of a project in Bristol, working with a professional storyteller and a local school to create wooden panels that form a storytelling trail through the school grounds. 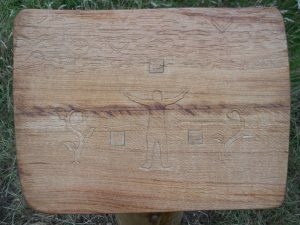 In July 2015, I was invited to carve oak pictures as part of a project at St Chad’s primary school in Patchway, Bristol. The school was looking to get the pupils to generate their own stories. 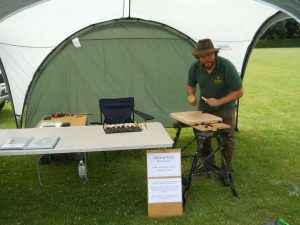 Storyteller Martin Maudsley worked with them to create tales which were then told to me. 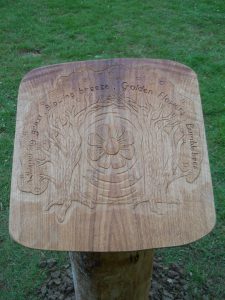 I used the five stories to produce images that were then carved into oak plaques, which were set onto larch plinths in a small woodland in the school grounds. One plaque tells a story about a storytelling dragon that befriends a village. At first, the villagers are advised by a little girl to turn their backs, to stop them being frightened by the dragon. Another shows a person who is helped by birds to plant a magic garden. 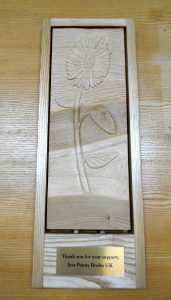 The small squares are caps of oak covering the stainless steel screws that hold the plaques firmly onto the larch plinths. This story is about a secret garden hidden by ancient trees, which is uncovered by reciting the magic words. 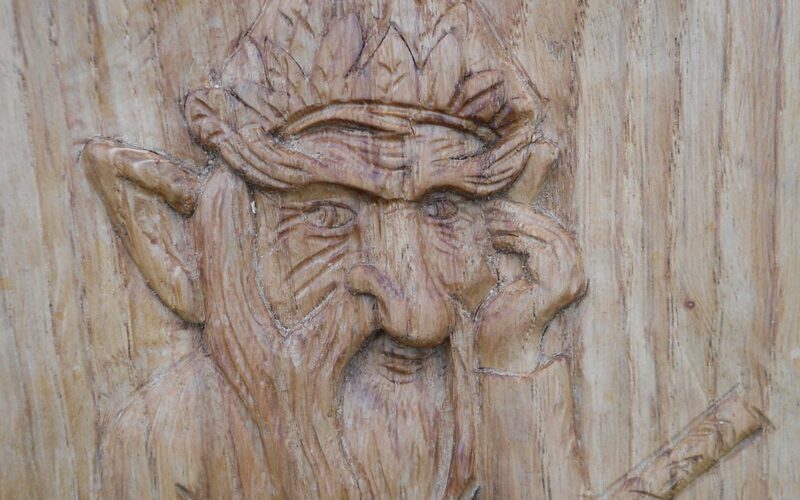 This plaque shows an old elf called the ‘Father of the Forest’. The surrounding leaves are all from trees that grow in the small woodland that the trail winds through. Finally there is a story about St Chad (a Saxon boy) and the people he meets on his adventures. 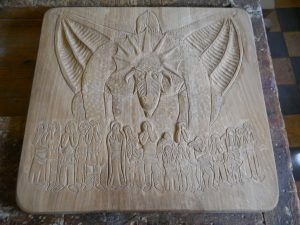 Part of the project also involved carving a panel live at Patchway community festival in Bristol, which was a lot of fun and meant that I also got to meet some of the parents whose children go to St Chads.